“the people down there” associated them with the region of habitation. The region is made up of mostly grass fields, a mountainous plateau. The region is known for its hilly relief and rich soil. Some of the valleys have the richer soil but are mixed with savanna and forest. It is common to find lots of volcanic rocks like basalt. “Bamilekè” is broken down into smaller tribes: Aghem, Babadjou, Bafang, Bafou, Bafoussam, Bagam, Baloum, Bamaha, Bamdendjina, Bamendjou, Bamenkoumbit, Bamenyam, Bana, Bandjoun, Bangangté,Bangoua, Bangwa, Bangwa-Fontem, Bapi, Batcham, Batchingou, Bati, Batié, Dschang, Fe'e Fe'e, Fomopea, Fongondeng, Foto, Fotouni, Mbouda. The Bamilekè region covers 6,196 square kilometers and extends 5°-6° N and 10°-11° E. Northwest they are protected by the Bamboutos Mountains located northwest and by the Noun River on the southeast side of the tribe boundaries. Brief history: Including some 100 kingdoms of chiefdoms in this bantu group. They are of varying size but similar in cosmology,social, and political structure. They all speak similar languages but some more specific to the immediate tribe. The Bamilekè refer to themselves as Bamilekè when speaking with non- Bamilekè tribes but specify their kingdoms when speaking with other Bamilekè tribe members. The Bamilekè region is divided into five administrative divisions in the western province: Bamboutos, Haut-Nkam, Mifi, Menoua, and Nde. Sexual division of production: Both men and women work in trade of the market place and of farming the product itself. They work eight-day weekly cycles and in long distance inter-ethnic exchange. Men are mostly responsible for tree crops and clearing the fields for the women and building any fences that are needed. They are dominant in the field of transportation; mainly men drive taxis and trucks since the pre-colonial involvement in animal husbandry and war. Land tenure: The kings in each kingdom are the owners of all land. Then there are quarter chiefs that distribute the land to the head males. The head males then distribute plots of land to their wives, non-inheriting brothers, and sisters. They nominate heirs and heiress who will inherit the land and responsibility of all dependents on the land. Ceramics: Religious sculptures are made for fertility, royalty, and wisdom. Lion Stool used by notables of the Fon's (kings) of the Bamileke court. Bamileke people, Cameroon Grasslands. The Bamileke tribe is governed by a village chief who is supported by a council of elders. In the past, the chief was believed to have supernatural powers that allowed him to turn into an animal (elephant, buffalo, or leopard). The chief is responsible for the protection of his people, dispensing supreme justice, and ensuring the fertility of the crops and fields. Many of the art produced by the Bamileke tribe associated with royal ceremonies. Most Bamileke statues represent the chief. Art objects showed the position of a person it the hierarchy. As a person descended or ascended the social ladder the materials used and the number of pieces changed. In a chief’s residence one would find ancestral figures and masks, as well as headdresses, bracelets, beaded thrones, pipes, necklaces, swords, horns, fans, elephant tusks, leopard skins, terracotta pots, and dishware. All of this was used to assert the chief’s power. Beadwork and masks are common in this tribe. Masks were decorated with copper, cowrie shells, and beads. They were carved to represent male and female heads, stag, buffalo, birds, and elephant. The elephant masks and the buffalo masks represented power and strength. 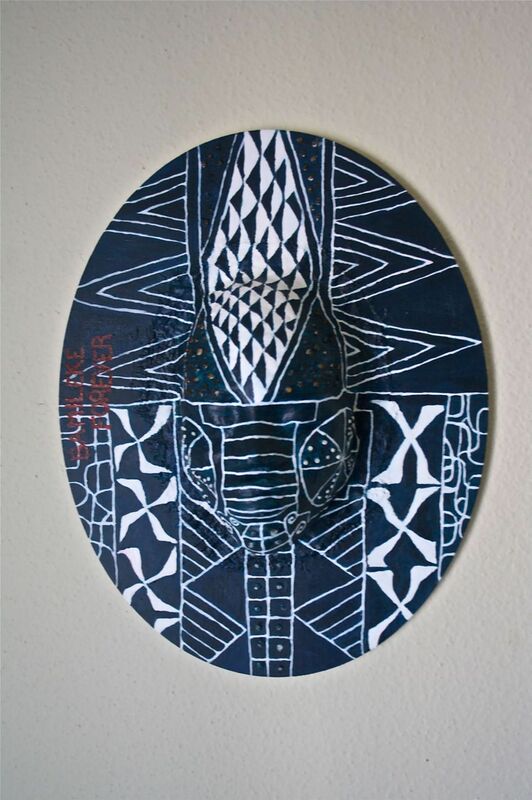 Bamileke masks were usually worn during ceremonies and rituals such as funerals and annual festivals. The art styles of the grassland tribes are had to differentiate because of the complex migration patterns of the region. In the Bamileke, the Kuosi society, who reports directly to the king, is responsible for dramatic masquerading displays. This was formerly a warrior society, whose members today are made up of powerful, wealthy men. Even the king may don a mask for an appearance at aKuosi celebration which is a public dance held every other year as a display of the kingdom's wealth. In the image to the left, you see the Kuosi masqueraders with their beaded elephant masks and feathered headressses. These feathered headresses were also worn by themselves with a cloth costume. The Kuosi society masks can resemble elephants or leopards, both of which are royal animals. While Bamileke masks and masqueraders may appear in royal festivals, they are normally associated with various men's societies, most of which are ultimately linked to the palace and the King. The societies are closed to outsiders, and only those who have the authrization to partake in the various activities may do so. Each society has its own special house, its own masks, costumes, dances and a secret language, and acting on behalf of the king to establish order and to preserve social and religious structures of the kingdom. One such society if the Kwifo (meaning 'night') society, who acts as a policing force while the king hears complaints and councils his people, carrying out punishments and executions at night. Acting as the kings agent, the Kwifo also mediates significant conflicts and pronounces sentence in both civil and criminal cases. Each Kwifo society has a mask which serves as a spokesman and representaive. Known as Mabu, this mask presents the decrees of the society to the community. It ushers the members of the Kwifo through the village, alerting the people of the approach of the group, and compelling them to behave appropriately. Other masks are credited with supernatural strength generated by the 'medicine' of Kwifo, and embody the aggessive and terrifying nature of the society. Because of the gravity of the events surrounding their arrival, the wearers do not dance. Kwifo masks are usually worn in groups of anywhere from eight to thirty, accompanied by and orchestra os drums, xylophone and rattles. When they make special apperances at the burial and commemorative death celebrations of a member of the group, they are viewed with awe and reverence. The mask large, and helmet-shaped, would be place on top of the head where it is worn at an angle, the masquerader's head would be covered with a cloth through which he would be able to see. The carved headdress alludes to that of a prestige cap worn by kings and high dignitaries, (see below) thus reminding viewers of the importance and high status of this society. 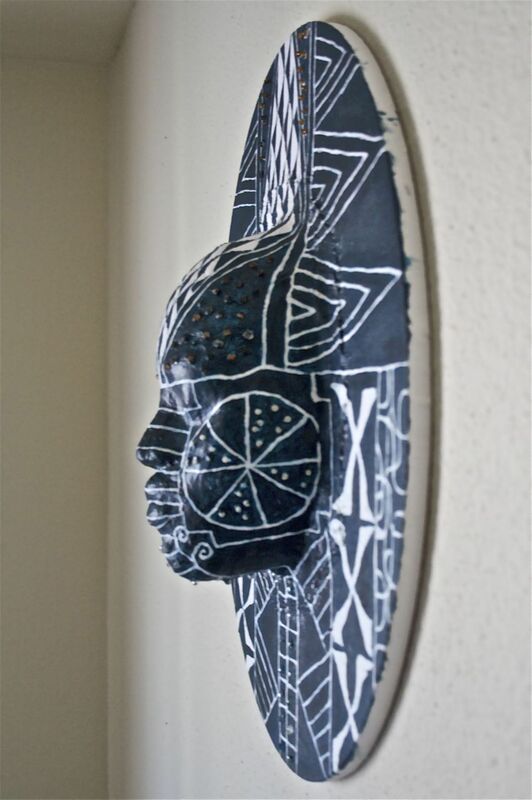 The Kwifo society masks are also known to be carved with the earth spider motif (see picture above) which alludes to the awesome power of the ancestors and spirits. The hairstyle shown in this kwifo mask is commonly seen among the Bamun, Bamileke and Tikar, and a frequently featured on brass, bronze, and wooded sculpture. This royal headdress is known as The Ndam Tcheu Dop in the Bamenda region, and asTcho Dung Dung in the Bandjan region of Cameroon. It is the coiffure most commonly reproduced by sculptures when creating their masks and commemorative statues. It's origin is from a royal cap that was worn, the cap was knitted or crocheted from raffia or vegetable fibers. It featured two lobes or prominent lateral sections. It's uniquness comes from the fact that each lobe is spiked with a multitude of tails, bumps, blades, or tiny rolls of cloth, each concealing a slim wooden peg to stiffen it or keep it upright. To the right is an example of the afore mentioned cap, collected in the Bali-Nyonga kingdom of Cameroon in 1911. It is believed to have been used by royals in a ritual context during initiation ceremonies and the enthronement of an important individual. her husband but to also “cook” or procreate children. to hearthside commensality and storytelling as the source of this solidarity.” Mothers pay the role in child rearing but sometimes the an older sibling or co-wife will help with care while the mother is working. The Bamiléké are exogamous, preventing patrilineal links up to the fourth generation from marrying. Also preventing marriage with the matrilineal kin. distinguished in everyday language. There are special sibling terms that are referred to in order of birth. Also another name for twins, children born following a set of twins, and there is a complex system of praise names that announce the village origin of mother and father. Generations also have a given name to specify kingdoms and divisions age. Political system: (chiefs, clans etc, wealth or status classes): There were kings who owned all land then trickled down a laddered hierarchy to women of the land owning men. Bamilekè boys in their youth go out seeking jobs in return for cash to buy consumer goods, bride wealth, and to gain title. d girls) will live there until they get married or go off to school. The kitchen house has one room with a hearth in the middle and a granary of raffia bamboo above the hearth. COUNTRY OF THE WEEK: Bamileke: The "Jews Of Cameroon"
Trade: The Bamiléké trade agriculture goods, game, small livestock for salt, palm oil, and iron hoes. Trade markets grew during the colonial and post-colonial eras. “Both local and European goods were bought or bartered.” The entrepreneurs are known for being aggressive. They dominate the taxi and transportation in most sectors they are associated with. Specialization (shamans and medicine): The community had diviners and spirit medians that determine the need for a ceremony and in healing. Healers and witches use the same supernatural powers.Many healers combine divination with herbal medicine. In the past, diviners, spirit mediums, and religious specialists had higher status than herbalists. This relation is now reversing, along with a trend toward more individual and fee-for-service treatment. Contemporary Bamiléké seek medical assistance from both private and public hospitals and clinics as well as from their rich array of traditional practitioners (see “Religious Practitioners”). Passage rituals (birth, death, puberty, seasonal): It is ritual that the mother buries the placenta and umbilical cord after birth. 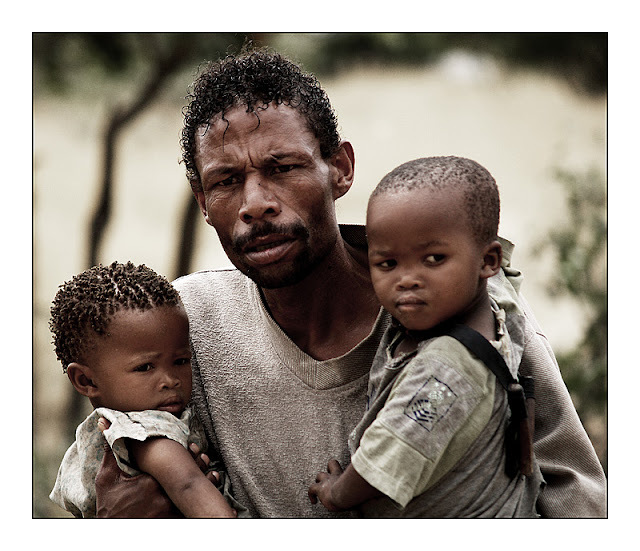 Baby boys are then circumcised and girls are secluded until pre-puberty. For the king: “Royal rituals enact the transformation of a new king from a mere mortal to a divine being, the embodiment of the office of kingship. These rituals include capturing the new king, and enclosing him and two of his queens in a special temporary structure ( la' kwa ) for nine weeks. Other rituals: Death ceremonies are held one year after the death and they are a public display of wealth and the value of the deceased. The mourning ends when the body has made a full transition into ancestorhood. Spirit medians, diviners, and religious specialists use herbal medicines. Herbalists are now seen as equals to the spirit medians, diviners, and religious specialists. Procession in Bandjoun in the western part of Cameroon. The public part of the initiation rite just before the circumcision of boys in the age of 6 to 8 years old. Myths (Creation): “All Bamiléké believed in the power of ancestors, through the metonym of the ancestral skull (tu ), to cause good or bad fortune for their descendants.” They believed the ancestral skulls control access to propitiary rights. If improper care of the ancestral skull follows death, there is said to be wrath, illness, infertility, and sometimes, even death. Cultural material (art, music, games): The Bamiléké are known for their wooden sculptures, masks, stools that are often decorated with beads and cowries, and carved house posts. The motifs include human figures usually representing ancestors, and witches, along with animals that represent fertility, wisdom, and royalty. It is ritually that the kings wear white and blue woven cotton cloth. Death and afterlife beliefs:Relatives shave their heads and wear blue or black clothing during the week of mourning. After one year of death, lavish celebrations are held. After the celebration the heir and heiress will exhume and care for ancestral skulls and keep them in clay pots or in small house-like tombs. Bamileke Boy gets ready for an initiation ritual in Procession in Bandjoun in the western part of Cameroon. The public part of the initiation rite just before the circumcision of boys in the age of 6 to 8 years old..
in the Grasslands consist of three graded ranks attained by wealth. These elephant masks, signifying kingship and wealth, were worn by the powerful members of the Kuosi regulatory society, which included members of royalty, wealthy title holders, and ranking warriors of the Bandjoun kingdom of western Cameroon. Bangwa Wooden Sculpture of a Mother Queen, Bamileke people, wood, h: 44”,Bangwa Kingdom, Cameroon, Africa, c. XVII th century - XIX th century. the two large, stiff circles hinged to either side of the head are its ears, which flap as the masker dances. While the mask symbolizes an elephant, the face is human. Eyeholes provide visibility, and a nose and mouth with teeth are normally present. cheers, and the celebration continues with various feats performed primarily by younger maskers. When the festivities end, the favorites are rewarded with kola nuts and wine (Brain and Pollock 1971:100-104; Northern 1975:17). front and back composed of indigo resist dyed cloth and a burlap lining; elaborately beaded overall with yellow, green, white and blue glass beads in geometric patterns. The beauty of these masks is largely in their colorful beaded patterns. Dark blue or red backgrounds provide foundations for basic geometric designs laid out in white, creating a striking contrast. As Tamara Northern indicates, the masks show varied degrees of order and complexity (1975:116).33 Masks may be sparsely or densely beaded. The mask's lavish use of colored beads and cowrie shells displayed the wealth of the members of the Kuosi society; and its colors and patterns expressed the society's cosmic and political functions. Cowrie shells are also symbols of wealth and power and were used in the some examples of these masks. Black denotes the relationship between the living and the dead. White refers to the ancestors and potent medicines. Red symbolizes life, women, and the institution of kingship. The dominant triangle designs on both masks represent leopard spots, the leopard being a royal symbol of power and mastery like the elephant. The members of the Kuosi regulatory society belonged to the royal court and enforced the laws of the kingdom in all spheres of life. The society gathered together during funeral ceremonies of its members and for public celebrations of kingship to display the Bandjoun kingdom's power and wealth. member of the mkem is head of a society with a specialized function: either religious, economic, military, or so on. The members of only two of these societies, the warrior societies of kuosi and kemdje, are allowed to wear the elephant masks and the leopard skins. Ceremonies in which the wealth of the fon is displayed take place on the death of a fon or a man of high rank, or every two years, during the most important meetings of these societies. Every item in the elephant mask costume denotes wealth, power and privilege. The multitude of glass beads which decorate it are ancient barter money, dating back to the slave-trade period. This display of wealth is in fact one of the functions of the mask. The elephant and the leopard are also evocative of force and power, both the power of the animals themselves, masters of the bush, and also that of the fon. For a fon is said to be able to transform himself into an elephant or a leopard. Aspiring young Cameroonian singer Kareyce Fotso has made it to the finals of RFI's "Découvertes" award (to be held in the Togolese capital, Lomé, on 25 November.) 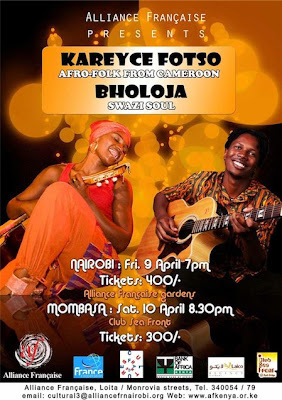 After honing her performance skills touring with the group Korongo Jam, Kareyce has now launched a promising solo career. RFI Musique profiles the rising new star of Afro-folk. 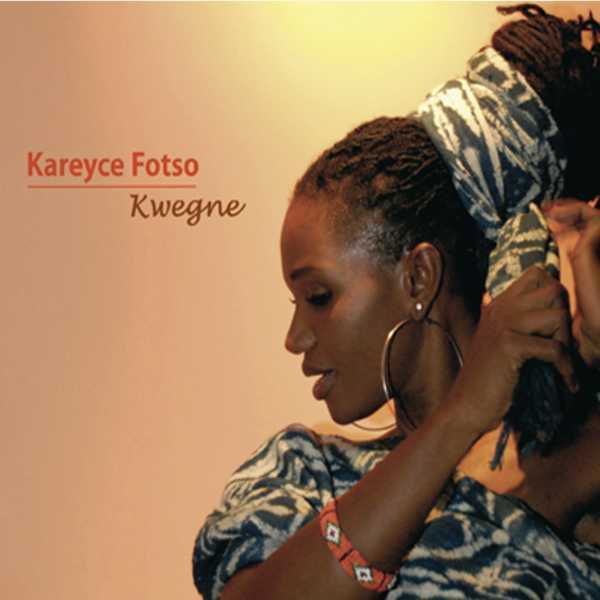 Kareyce Fotso's voice has a soothing quality to it, enveloping the room in a sense of calm the minute she starts to speak. Kareyce famously worked her charm on the jury at the 6th "Jeux de la Francophonie" contest organised in the Lebanese capital in October 2009, her soft, velvet tones winning her the silver medal in Beirut's prestigious "chanson" contest. Too nervous to wait up front with the rest of the audience for the results that night, the Cameroonian singer fled backstage to her dressing-room. "People kept coming and knocking on my door," she remembers, "but I couldn't bring myself to go out. When they announced the winners my first reaction was to break down in tears. At that moment all I wanted was to be back home with my family and friends, sharing my happiness with everyone who'd believed in me. I wanted to let them know they'd backed the right horse, after all!" Although Kareyce was pleased as punch with her silver medal, she nearly did not make the trip to Beirut for "Les Jeux de la Francophonie." To earn her place on the Cameroonian delegation, she was required to qualify at a preliminary contest organised by the Ministry of Culture in her homeland at the end of 2008. Kareyce did not fancy her chances too much and it was only after much insistence from a sculptor friend that she agreed to put her name down in the first place. On the morning of the competition Kareyce turned up late and got roundly ticked off by the jury. What's more, unlike her rival candidates, she turned up to perform alone, accompanying herself on stage on guitar. "I never made a deliberate decision to perform solo," she says," That's just the way it happened. I didn't want to call my musicians to go with me because I was feeling a bit rushed into things, a bit pressurised to put in an appearance. But I got a standing ovation after my solo performance and it was at that point that I started thinking maybe I didn't need a backing band on stage." A few weeks after the national heat for the "Jeux de la Francophonie", Kareyce applied to take part in the "Visas pour la création" programme organised by CulturesFrance. 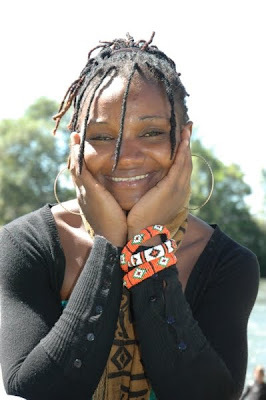 Her dossier was accepted and the young Cameroonian singer won a grant to come to France and take up a three-month residency in Bourges in May 2009. Here, Kareyce got to work with the French percussionist François Kokelaere (renowned for forming a number of groups including Les Percussions de Guinée) who took on the role of her artistic director. "François got me to look in the mirror and see myself as I really am," Kareyce recalls, "That experience helped me avoid falling into any sort of caricature. And it went way beyond music, too. I felt as though I'd truly discovered myself for the first time in my life." 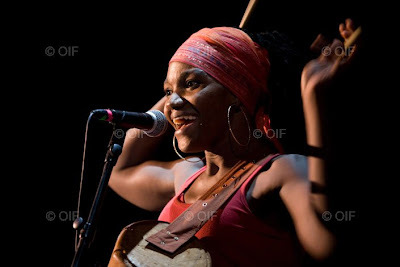 Prior to her arrival in Bourges, Kareyce spent six years honing her performance skills as a dancer and backing singer with Korongo Jam (a Cameroonian group to whom François Kokelaere also acted as an advisor.) Her talent was originally spotted while she was still a student at the University of Yaoundé. Here, she started out studying biochemistry which she describes as "the worst time of my life - I was literally bored to tears!" Kareyce eventually swapped to do a course in audiovisual communication but music remained the great love of her life. Her father, a professional sculptor all too familiar with the precariousness of the artistic life, had banned his children from pursuing a career in the arts. But Kareyce's brother, who was sent to boarding school to get him away from the music scene, finally persuaded his parents to let his sister follow her dreams. Kareyce was allowed to indulge her passion for music so long as she got good grades at school and the talented youngster managed to do both at the same time, keeping her classmates amused in school by performing her own versions of cartoon theme tunes. Kareyce, who grew up listening to traditional lullabies sung by her mother (a Bamileke "weeper" hired to mourn at funerals), also claims the Cameroonian bikutsi singer Anne-Marie Nzié as one of her greatest mentors. "Anne-Marie Nzié has one of the greatest voices in the world," Kareyce declares, "She was the one who taught me to sing. I never came into personal contact with her, but I listened to her music all the time." Kareyce also cites Miriam Makeba, B.B. King, Ella Fitzgerald, Erykah Badu, Ismaël Lo, Cesaria Evora and the famous Cameroonian bassist Richard Bona as formative influences. After six years with Korongo Jam, Kareyce says she felt "psychologically and emotionally ready" to embark upon a solo career, even if that meant financing the recording of her debut album herself. 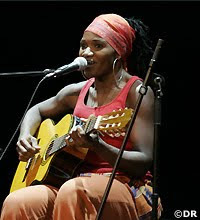 Her acoustic Afro-folk sound took shape in the studio with Mulato, an album recently released in Cameroon. "'Mulato' means someone of mixed origin like myself!" 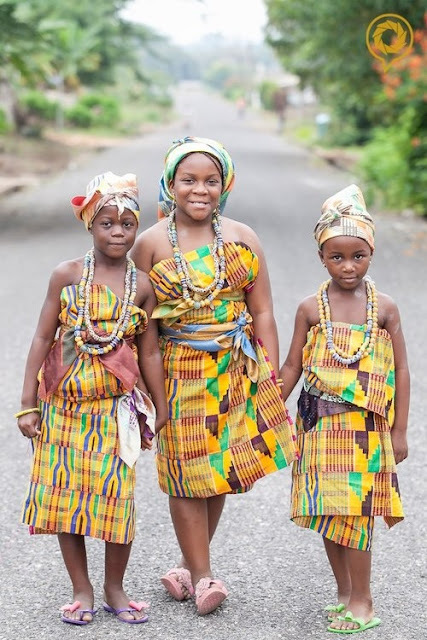 Kareyce says, "I'm a Bamileke, but I was born and grew up with the Beti. What I wanted to do on my album was express how incredibly rich life becomes when you can draw on both cultures at once!" I have just found out that my DNA traces back to the Bamileke People. I am very happy on this day to have this knowledge and I am eager to learn more. I live in the United States and I am very happy to find information of my "Home". Greetings, I am a writer living in St. Louis, Missouri and have recently discovered that my ancestors are the Bamileke and I have many questions. I'm proud,excited,and anxious to learn as much as I can. I would like to converse with someone who is Bamileke and wouldn't mind chatting with me. Tracing my DNA, I have found that my ancestry goes back to Cameroon. I have gone back to 1817 here in America and I am now trying follow the slave ships from West Africa to the shores of Virginia and North Carolina. I'm also trying establish the history of the 12 tribes of Israel. please give credits for links to where to images you have in your post were found. I have traced my father's ancients back to the Bamileke People in current day Cameroon. I am living in Chicago, however, I am from North Carolin, USA. I was blown away the first time that I read the history of my people. I have own a coffee company and restaurant; importing coffee out of Cameroon, and I read that my people were business minded and brought coffee and Christianity to that part of the continent! I am an art and art history teacher, and I want to learn more about the art that is produced by my family.